I've always loved doing jigsaw puzzles, and over the last few years as I've had more time to myself I've had fun completing many. But my enjoyment in completing a jigsaw puzzle increased significantly when I treated myself to a large jigsaw mat and holder. I bought the Puzzle Mates Portapuzzle Deluxe (affiliate link) and it really has made a huge difference to speed and efficiency with which I can complete a puzzle, meaning that it's not nearly as daunting to start a new puzzle as it used to be. This board opens up fully, and also contains two removable inserts which are each half the size of the jigsaw building area. 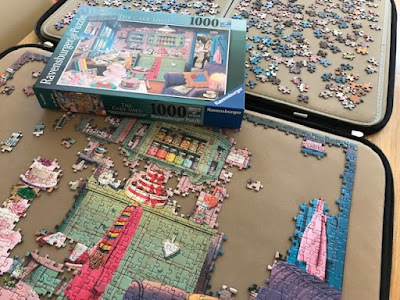 If you have the space to leave the board fully open on a large table you can lay out all the pieces from a 1000 piece jigsaw, making it much easier to sort pieces by colour or to hunt for a specific piece. If you leave one of the sides empty you can fold up the puzzle and put it away to clear some space. I would absolutely recommend this board or something similar if you enjoy doing jigsaw puzzles! I thought I'd do a bit of research into some other products which might make solving jigsaw puzzles easier and more fun. The second most important thing that I discovered was some form of Sorting Trays (affiliate link). I've been known to improvise by using trays or even paper plates to sort out pieces by colour or type, but the good thing about trays like this is that they can stack to save space, they are stable, and they make it easier to keep track of all your pieces and prevent them getting lost. If you are really serious about jigsaw puzzle completion then it's great to be able to devote an area of the home to them with a dedicated Jigsaw Puzzle Table (affiliate link). I can't get away with one of these at the moment, but luckily I have a dining table that I can usually dedicate to my puzzle habit. If you want to display your jigsaw once finished you have a couple of options. Personally I put them away within a day or so of completing them, as for me the enjoyment in a puzzle comes from the assembly. But you can buy special Conserver Glue (affiliate link) - an adhesive that is applied to the surface of your completed jigsaw allowing you to preserve it in its finished state. You can then frame the jigsaw and keep it out on display. If you don't want to glue your jigsaw (and personally I never would!) 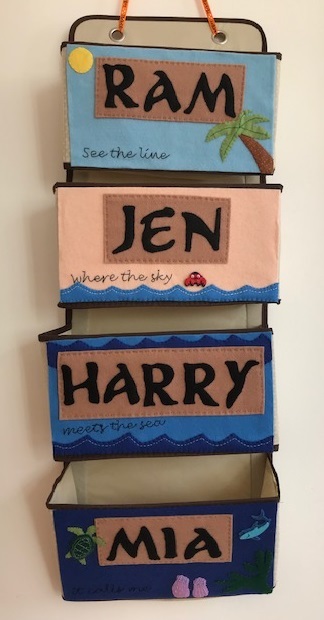 there are also frames which you can buy to display a finished puzzle that don't require the pieces to be stuck together. You can see some examples here - jigthings Jigsaw Frames. I hope I've inspired you to give a jigsaw puzzle a go. If you aren't convinced I've also written about the benefits of doing jigsaw puzzles, it's a great hobby! My teen is really into jigsaws at the moment and is saving for a board to keep it safe.